The long leading indicators have now crossed a threshold. Manufacturing jobs rose 18,000 for an average of 22,000/month in the past year vs. the last seven years of Obama's presidency in which an average of 10,300 manufacturing jobs were added each month. March was revised upward by 20,000. April was revised downward by -5,000, for a net change of 15,000.
the average manufacturing workweek declined -0.2 hours from 41.0 hours to 40.8 hours. This is one of the 10 components of the LEI. construction jobs increased by 25,000. YoY construction jobs are up 286,000.
temporary jobs decreased by -7800.
the number of people unemployed for 5 weeks or less decreased by -81,000 from 2,115,000 to 2,034,000. This is a new post-recession low. Overtime declined -0.2 hours from 3.7 hours to 3.5 hours. Professional and business employment (generally higher-paying jobs) increased by 23,000 and is up +206,000 YoY. the index of aggregate hours worked in the economy rose by 0.2%. the index of aggregate payrolls rose by 0.5%. the alternate jobs number contained in the more volatile household survey increased by +293,000 jobs. This represents an increase of 2,582,000 jobs YoY vs. 2,363,000 in the establishment survey. the overall employment to population ratio for all ages 16 and up rose 0.1% to 60.4 m/m and is up 0.4% YoY. This was an excellent report with only a few drawbacks. Both unemployment and underemployment fell to rates not seen since the turn of the Millennium. Perhaps more significant, average hourly earnings for nonsupervisory workers increased at the highest rate since 2009. The trend over the last 6 months has been rising, and it appears that ordinary workers are finally getting a little wage traction. Other good news included the continued decline in involuntary part-time employment, and the decline in short term unemployment to its lowest level in the expansion. There were a few negative notes, including an increase in discouraged workers, a decline in the manufacturing workweek (which really just took back April's gain), a decline in the leading temp jobs number, and a deceleration in gains in the higher-paying business and professional category. Further, undoubtedly this report will signal to the Fed that it is OK to raise interest rates again. This report was a continuation of the recent string of very good reports, as last autumn's big increase in consumer spending feeds through into jobs. I nevertheless expect the late cycle trend of deceleration to re-assert itself over the next few months. Corporate profits for Q1 were repored yesterday as part of the GDP update. They are both a long leading indicator for the economy as a whole, and they also lead the stock market, when the latter is averaged quarterly. By both measures, they are flashing caution. One of my pet peeves is that economics as a discipline needs to import the entirety of learning theory from psychology, not just parlor tricks like the endowment effect. For example, learning from models. To wit, once Jack Welch was successful in using a pay scheme at GE that ensured that a given percentage of employees would not get a raise in any given year, it was inevitable that other employers who adopt the idea until it spread throughout corporate America. And it not giving raises to a certain percentage of employees was successful, why not implement it across the board with *all* employees? his was rare, candid and bracing talk from executives atop corporate America, made at a conference Thursday at the Dallas Fed. The message is that Americans should stop waiting for across-the-board pay hikes coinciding with higher corporate profit; to cash in, workers will need to shift to higher-skilled jobs that command more income. ....The moderator asked the panel whether there would be broad-based wage gains again. "It's just not going to happen," [Troy] Taylor, [CEO of the Coke franchise for Florida,] said. The gains would go mostly to technically-skilled employees, he said. As for a general raise? "Absolutely not in my business," he said. This is putting even more deflationary pressure on wages. Since the refinancing spigot has been turned off due to the end of the secular decline in interest rates, if wages don't increase, exactly where do employers think increased demand is going to come from? Further, if companies freeze wages even during good times, what is going to happen when, inevitably, times turn bad? 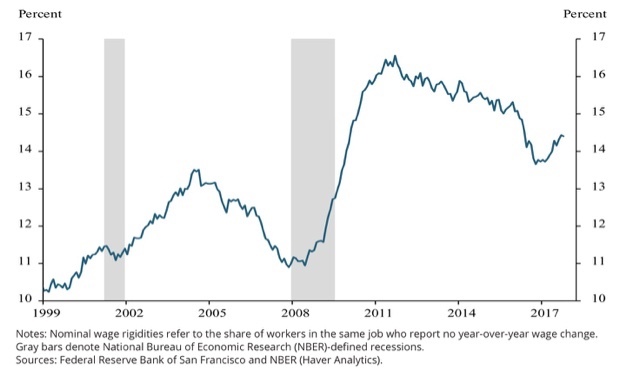 Currently wage growth for nonsupervisory workers is running at 2.6% YoY. Wage freezes are likely to be endemic in the next recession, and even worse, outright wage cuts, potentially leading to a deflationary wage-price spiral, are a significant possibility for the first time in over 80 years.